The Gaza Strip is a narrow strip of land just northeast of the Sinai Peninsula. At the end of the 1948 Arab-Israeli War it was occupied by the Egyptians, under which it remained until it was claimed by Israel during the Six-Day War of 1967. 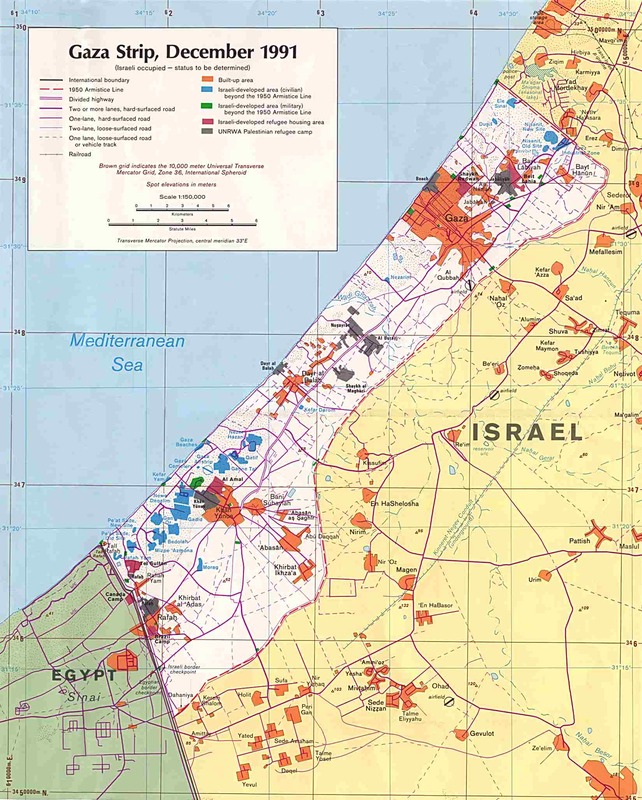 The Gaza Strip is unusual in being a densely settled area not recognized as a de jure part of any sovereign country. Together with parts of the West Bank, it is mostly run by the Palestinian Authority. Substantial portions of the Gaza Strip, (mainly the sites of areas populated by Israeli citizens) are controlled by Israel. The Palestinian Authority is not permitted conventional military forces; there are, however, a Public Security Force and a civil Police Force. In February 2005 the Israeli government voted to withdraw Israel's presence from the Gaza strip during the summer of 2005, including dismantling all the Israeli settlements and removing all Israeli settlers from the strip. After withdrawal Israel may still retain some offshore maritime control and/or a small strip of land (the so-called "Philadelphi Corridor") alongside the Egypt-Gaza Strip border. The government still faces significant opposition to the plan. Around 1.37 million Palestinians and over 8,000 Israelis live in the Gaza Strip. The majority of the Palestinians are direct descendants of refugees who fled Israel during the 1948 Arab-Israeli War. By 1967 the population had grown to about six times its 1948 size. The city's population has continued to increase since that time, and poverty, unemployment, and poor living conditions are widespread as a result of the record high birth rate (5.91 children born/woman on average) Gaza has a high population density. Since the 1970s, around 25 Israeli settlements have been constructed in the Gaza Strip, though as of 2005 the Israeli government plans to remove all Israelis from these settlements. The Israeli settlemnts were built on sand dunes that were not used by the Palestinian residents of Gaza but now use more per capita than the Palestinian population. The Palestinian population is growing by around 4% a year. Most people in the strip are Muslim, with small Christian (0.7%) and Jewish (0.6%) minorities. The Jews in Gaza strip live only in the israeli settlements. There are no Jews in the areas controlled by Palestinians. The Gaza Strip is located in the Middle East (at Template:Coor dm). It has an 11km border with Egypt, near the city of Rafah, and a 51km border with Israel. Religious and nationalist Jews claim the entire Gaza Strip as part of Israel while nationalist Palestinians claim it as part of a future Palestinian state they intend to create. Some Israelis including Israeli Prime Minister Ariel Sharon intend to unilaterally withdraw from Gaza and remove all the Jewish residents which reside mainly in Gush Katif along the South Western coast of Gaza. It also has a 40 km coastline onto the Mediterranean Sea, but has no maritime claims due to Israeli military Administration. The Gaza Strip has a temperate climate, with mild winters, and dry and hot summers, subject to drought. The terrain is flat or rolling, with dunes near the coast. The highest point is Abu 'Awdah (Joz Abu 'Auda), at 105 metres above sea level. Natural resources include arable land (about a third of the strip is irrigated), and recently discovered natural gas. Environmental issues include desertification; salination of fresh water; sewage treatment; water-borne disease; soil degradation; and depletion and contamination of underground water resources. It is considered to be one of the fifteen territories that comprise the so-called "Cradle of Humanity." It currently holds the oldest remains of a manmade bonfire, some of the worlds oldest dated humanoid skeletons and possibly the oldest form of written language containing abstract symbols (Negev-hebrew) although markings found in Egypt are contesting for this title. Economic output in the Gaza Strip—under the responsibility of the Palestinian Authority since the Cairo Agreement of May 1994—declined by about one-third between 1992 and 1996. This downturn has been variously attributed to corruption and mismanagement by Yasser Arafat and to Israeli closure policies—the imposition of generalized border closures in response to terror attacks in Israel—which disrupted previously established labor and commodity market relationships between Israel and the Strip. The most serious negative social effect of this downturn was the emergence of high unemployment. Israel's use of comprehensive closures decreased during the next few years and, in 1998, Israel implemented new policies to reduce the impact of closures and other security procedures on the movement of Palestinian goods and labor. These changes fueled an almost three-year-long economic recovery in the Gaza Strip. Recovery was ended in the last quarter of 2000 with the outbreak of the al-Aqsa Intifada, triggering tight Israeli closures of Palestinian self-rule areas and a severe disruption of trade and labor movements. In 2001, and even more severely in early 2002, internal turmoil and Israeli military measures in Palestinian Authority areas resulted in the destruction of capital plant and administrative structure, widespread business closures, and a sharp drop in GDP. Another major loss has been the decline in income earned by Palestinian workers in Israel. According to the CIA World Factbook, GDP in 2001 declined 35% to a per capita income of $625 a year, and 60% of the population is now below the poverty line. Gaza Strip industries are generally small family businesses that produce textiles, soap, olive-wood carvings, and mother-of-pearl souvenirs; the Israelis have established some small-scale modern industries in an industrial center. Electricity is supplied by Israel. The main agricultural products are olives, citrus, vegetables, beef, and dairy products. Primary exports are citrus and cut flowers, while primary imports are food, consumer goods, and construction materials. The main trade partners of the Gaza Strip are Israel, Egypt, and the West Bank. A study carried out by Johns Hopkins University and Al Quds University for CARE International late in 2002 revealed very high levels of dietary deficiency among the Palestinian population. The study found that 17.5% of children aged 6–59 months suffered from chronic malnutrition. 53% of women of reproductive age and 44% of children were found to be anemic. The Gaza strip has a single standard gauge railway line running the entire length of the strip from north to south along its center, however, it is abandoned and in disrepair, and little trackage remains. The line used to connect to both the Egyptian railway system to the south as well as the Israeli system to the north. It has a small, poorly developed road network. Its one port is Gaza City. It has two airports, one paved, one unpaved, including Gaza International Airport, which opened on 24 November 1998 as part of agreements stipulated in the September 1995 Oslo II Accord and the 23 October 1998 Wye River Memorandum. GIA was largely closed since October 2000 by Israeli orders and its runway was destroyed by the Israel Defense Force in December 2001. Gaza has a seaport, which was also closed by the Israeli army. The Gaza strip has a rudimentary telephone service provided by an open wire system, two TV stations run by the Palestinian Broadcasting Corporation (which is controlled by the Palestinian Authority), and no radio stations. It has four internet service providers. Most Palestinian households have a radio and a TV, but there are no figures available. This page was last modified 08:12, 23 Jun 2005. This page has been accessed 18846 times.